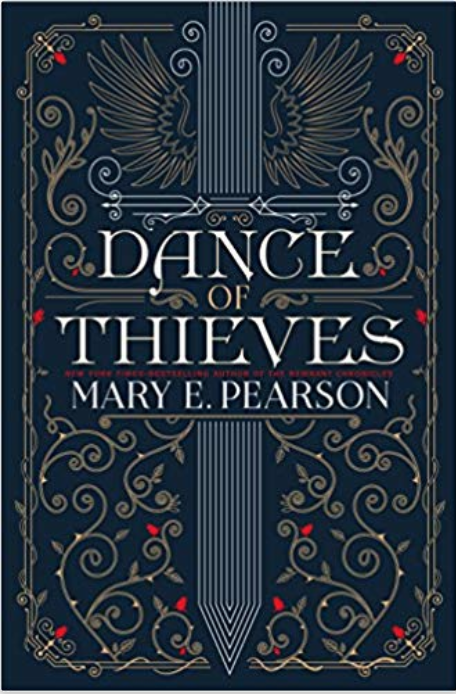 July | 2015 | DEBtastic Reads! Welcome to Throwback Thursday Interviews. These are interviews I conducted with favorite authors over the years, when I used to post them on my web site. I’ll be resurrecting the interviews here in hopes of introducing you to new authors. Who knows? Maybe you’ll discover a new favorite author! Here is my 2009 interview with Justina Chen featuring her YA novel North of Beautiful. In your YA novel, North of Beautiful, Terra’s story is about her journey of self-discovery – in learning to accept herself and others, rather than trying to escape what makes her uncomfortable. I think that many of us have a natural tendency to do this – to avoid things that are out of our comfort zone. How did you get into Terra’s head? What things make you uncomfortable and how do you overcome your fears? It was easy to get into Terra’s head because in many ways, it’s my head! So many things make me uncomfortable—finances and balancing my checkbook, for one. I love to travel, but the logistics of getting from place to place sometimes scare me. Living in China without any hard cash scared me. So did not speaking the language and knowing people were making fun of me. BUT. Like Jacob’s mother in North of Beautiful says, I don’t want fear to stop me from having an experience I want to have. So I’ve learned to throw myself into whatever it is that I want to try. And then remember, bumps are part of the journey. That’s how we learn. And we need to be scared at least a little bit to keep us growing. And humble. How did this story come to you? And what challenges did you face in writing this rich and layered story? Like so many of my stories, the inspiration for this story came through a chance conversation. I had just finished speaking at a middle school and I recognized one of the boys there. He was Mr. Cool on campus: athletic, good-looking, witty. And he has a portwine stain on his face. A couple of days later, I bumped into his mom and I was telling her what a great job she had done parenting him because he didn’t let his birthmark get in his way. She looked at me and said, “That’s because he’s a boy.” That got me thinking: what would it be like for a girl to be under constant scrutiny? What if she had a father who put a premium on physical perfection and her birthmark was a personal affront to him? With Terra, I was able to tackle the whole notion of beauty, a topic that’s been at the forefront of my mind as a mother, woman, and writer! When did size 00 become the figure we are all supposed to attain? Fitting in everything I wanted to say—exploring the notion of True Beauty fully—within the confines of a novel was challenging to say the least. Terra struggles between feeling abandoned by her brothers and feeling loyal to her mother, all while resenting her father. How hard was it for you to dig into all these characters and get to know them? What do you do as a writer to get to know your characters? Writing any scene with Terra’s father was really difficult for me emotionally. I’ve been around too many controlling men. One of my teen readers was the impetus for tackling a story with an emotionally abusive relationship. She approached me after one of my readings and commiserated about how she, too, had been afraid of going after her dreams. Her father belittled her ambitions. I knew I had to write this story for girls who have been knocked down by Those Who Think They Know Better (but don’t). I love Jacob – the Goth Chinese boy who unnerves Terra with his straight-forward honesty. He might be my favorite in this book. Was he based on anyone you know? My editor’s first words to me when she finished NORTH OF BEAUTIFUL: I am in love with Jacob. Jacob is based on two dear friends of mine. One is my best friend from college who was always there for me—as steady as a friend could be. And the other a man I met years ago when I was working on another novel. Totally irreverent and adventurous. And then, of course, there was a whole bunch of fantasizing (I mean, harnessing of my imagination) to create the gestalt of Jacob, black fingernails and all. 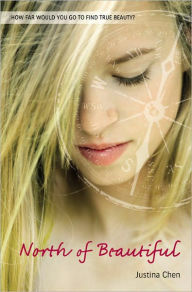 Note: If you love great characters, emotional depth, and romance, I highly recommend North of Beautiful. It was one of my favorite reads that year. I’m definitely going to check out her newest novel! To learn more about Justina, her books, and her causes, check out her web site. Looking for a perfect summer read picture book? Look no more! 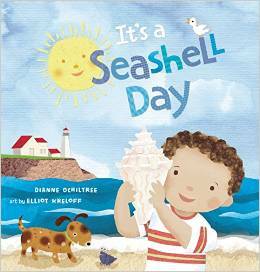 It’s A Seashell Day by Dianne Ochiltree is a story about a child and mom spending a day at the beach, searching for shells and other treasures. The bright collage-like illustrations by Elliot Kreloff are a joyful companion to the rhyme that rises and crests like waves on the shore. A perfect beach read for parent and child. 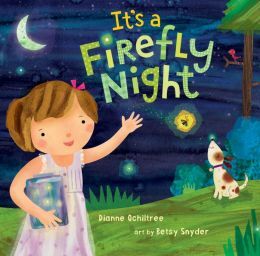 Dianne Ochiltree is also the author of the picture book It’s A Firefly Night. Read both together! Read my spotlight interview with her for It’s A Firefly Night. For more about Dianne and her books, check out her web site.